How are the frequency rates of Amazon, Google, and Netflix even possible? It's because these companies have figured out how to make a nearly perfect DevOps pipeline. This definitely wasn't the case before we implemented DevOps at Citi. Back then, my team had different staged environments, but deployments to the development server were very manual. All developers had access to just one development server based on IBM WebSphere Application Server Community Edition. The problem was the server went down whenever multiple users simultaneously tried to make deployments, so the developers had to let each other know whenever they were about to make a deployment, which was quite a pain. In addition, there were problems with low code test coverages, cumbersome manual deployment processes, and no way to track code deployments with a defined task or a user story. I realized something had to be done, and I found a colleague who felt the same way. We decided to collaborate to build an initial DevOps pipeline—he set up a virtual machine and a Tomcat application server while I worked on Jenkins, integrating with Atlassian Jira and BitBucket, and code testing coverages. This side project was hugely successful: we almost fully automated the development pipeline, we achieved nearly 100% uptime on our development server, we could track and improve code testing coverage, and the Git branch could be associated with the deployment and Jira task. And most of the tools we used to construct our DevOps pipeline were open source. I now realize how rudimentary our DevOps pipeline was, as we didn't take advantage of advanced configurations like Jenkins files or Ansible. However, this simple process worked well, maybe due to the Pareto principle (also known as the 80/20 rule). If you ask several people, "What is DevOps? you'll probably get several different answers. DevOps, like agile, has evolved to encompass many different disciplines, but most people will agree on a few things: DevOps is a software development practice or a software development lifecycle (SDLC) and its central tenet is cultural change, where developers and non-developers all breathe in an environment where formerly manual things are automated; everyone does what they are best at; the number of deployments per period increases; throughput increases; and flexibility improves. While having the right software tools is not the only thing you need to achieve a DevOps environment, some tools are necessary. A key one is continuous integration and continuous deployment (CI/CD). This pipeline is where the environments have different stages (e.g., DEV, INT, TST, QA, UAT, STG, PROD), manual things are automated, and developers can achieve high-quality code, flexibility, and numerous deployments. This article describes a five-step approach to creating a DevOps pipeline, like the one in the following diagram, using open source tools. The first thing you need is a CI/CD tool. Jenkins, an open source, Java-based CI/CD tool based on the MIT License, is the tool that popularized the DevOps movement and has become the de facto standard. So, what is Jenkins? Imagine it as some sort of a magical universal remote control that can talk to many many different services and tools and orchestrate them. On its own, a CI/CD tool like Jenkins is useless, but it becomes more powerful as it plugs into different tools and services. Jenkins is just one of many open source CI/CD tools that you can leverage to build a DevOps pipeline. 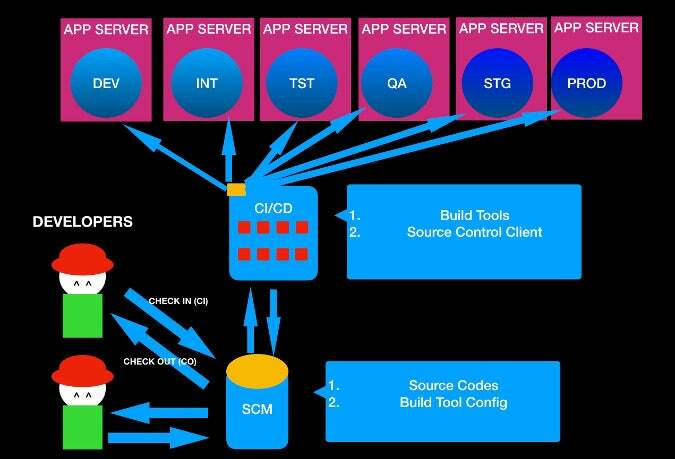 Here's what a DevOps process looks like with a CI/CD tool. You have a CI/CD tool running in your localhost, but there is not much you can do at the moment. Let's follow the next step of DevOps journey. This is where SCM becomes almost a necessity. 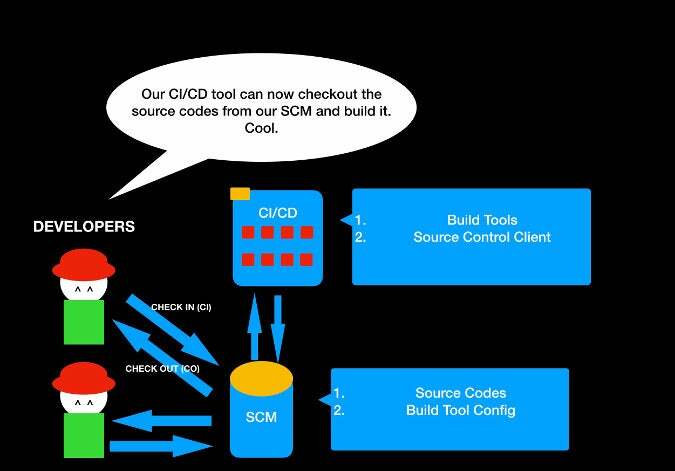 A SCM tool helps by storing your code in repositories, versioning your code, and coordinating among project members. Although there are many SCM tools out there, Git is the standard and rightly so. I highly recommend using Git, but there are other open source options if you prefer. Here's what the DevOps pipeline looks like with the addition of SCM. The CI/CD tool can automate the tasks of checking in and checking out source code and collaborating across members. Not bad? But how can you make this into a working application so billions of people can use and appreciate it? Enter the build automation tool. No matter which build tool you decide to use, all build automation tools have a shared goal: to build the source code into some desired format and to automate the task of cleaning, compiling, testing, and deploying to a certain location. The build tools will differ depending on your programming language, but here are some common open source options to consider. Awesome! You can put your build automation tool configuration files into your source control management and let your CI/CD tool build it. Everything is good, right? But where can you deploy it? So far, you have a packaged file that might be executable or deployable. For any application to be truly useful, it has to provide some kind of a service or an interface, but you need a vessel to host your application. For a web application, a web application server is that vessel. An application server offers an environment where the programming logic inside the deployable package can be detected, render the interface, and offer the web services by opening sockets to the outside world. You need an HTTP server as well as some other environment (like a virtual machine) to install your application server. For now, let's assume you will learn about this along the way (although I will discuss containers below). There are a number of open source web application servers available. Now the DevOps pipeline is almost usable. Good job! Although it's possible to stop here and integrate further on your own, code quality is an important thing for an application developer to be concerned about. Implementing code test pieces can be another cumbersome requirement, but developers need to catch any errors in an application early on and improve the code quality to ensure end users are satisfied. Luckily, there are many open source tools available to test your code and suggest ways to improve its quality. 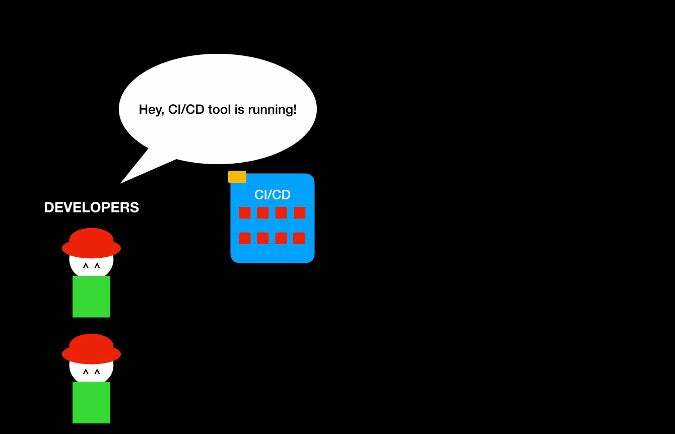 Even better, most CI/CD tools can plug into these tools and automate the process. There are two parts to code testing: code testing frameworks that help write and run the tests, and code quality suggestion tools that help improve code quality. Now that you've implemented code testing coverage tools, your DevOps pipeline should resemble the DevOps pipeline diagram shown at the beginning of this tutorial. As I mentioned above, you can host your application server on a virtual machine or a server, but containers are a popular solution. What are containers? The short explanation is that a VM needs the huge footprint of an operating system, which overwhelms the application size, while a container just needs a few libraries and configurations to run the application. There are clearly still important uses for a VM, but a container is a lightweight solution for hosting an application, including an application server. Although there are other options for containers, Docker and Kubernetes are the most popular. Our DevOps pipeline mostly focused on collaboratively building and deploying an application, but there are many other things you can do with DevOps tools. One of them is leveraging Infrastructure as Code (IaC) tools, which are also known as middleware automation tools. These tools help automate the installation, management, and other tasks for middleware software. For example, an automation tool can pull applications, like a web application server, database, and monitoring tool, with the right configurations and deploy them to the application server. 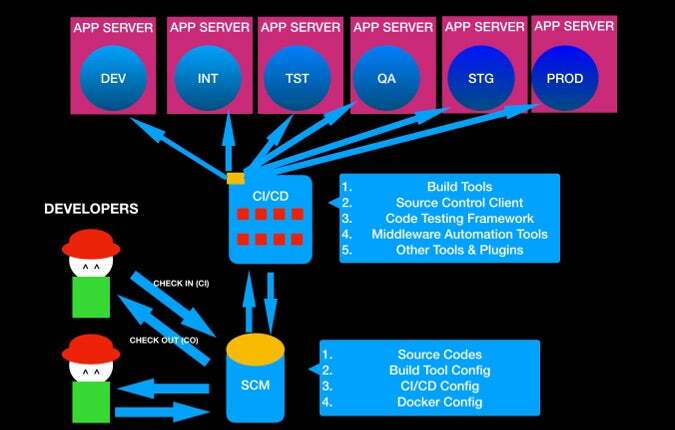 This is just the tip of the iceberg for what a complete DevOps pipeline can look like. Start with a CI/CD tool and explore what else you can automate to make your team's job easier. Also, look into open source communication tools that can help your team work better together. Really liked the article. I just need to ask: C++ is a proprietary language? I tought was open as C. C# I know is proprietary. C++ itself is a language, not a specific implementation, so there's no source code available for the standard/language itself. Some C++ implementations are open source (e.g., Gnu and Clang). Thank you, just as you said! Thank you. GitLab is awesome. Why Gitlab CE is not even mentioned as a CI/CD alternative? Thank you. Git Lab is a good alternative. C#/.net core is open source these days.